On a week when another Australian family has been destroyed by domestic violence, Angus Cerini’s bloody, uncompromising play The Bleeding Tree feels like it comes at precisely the right time. Because while the work stares unblinkingly at the scourge of male brutality in this country, this isn’t a story of victims and their victimisation; it’s a story of vengeance and retribution, of that moment women decide they’ve had enough and take back their power. An unnamed mother (Paula Arundell) stands over the body of her dead husband, flanked by her daughters (Brenna Harding and Sophie Ross). While mum was ultimately responsible for the “great black hole in his neck”, the girls helped in their own way; one whacked him on the knees while the other “conked him on the head”. It was significantly a joint effort. As they triumphantly tower over the corpse, they remember the qualities of the man, and the audience is quickly satisfied that the killing was not only justified but necessary. Just as they are trying to move the body, the local copper, Old Man Jones, comes by. He’s heard a shot, “just the one”, and has come to check it out. The role of Jones, just like that of the husband and the subsequent interlopers, is shared by the three actors – they take turns vocalising the character, and the effect is rather uncanny, like possession. It’s a theatrical device that has a kind of choral effect too, which will come to reinforce the play’s themes. Just what Old Man Jones does, is best left unsaid. Needless to say, his response is telling, as is the response of the next person to turn up, and the next. With brilliant economy, Cerini is able to suggest a whole township of people – and by extension, a country – willing to confront a menace only when the threat has passed. It’s perfectly human and understandable and, according to the playwright, not bloody good enough. All of which makes the play sound incredibly serious (which it is) and depressing (which it decidedly isn’t). Actually, it’s often wickedly funny, in a black and gory sense. The descriptions of the man’s rotting corpse are so gleefully visceral they are more early-Peter Jackson than Australian Gothic. And the drawn-out tensions around the townspeople’s responses are delicious, like something in a Tarantino flick. Lee Lewis’s direction is so good it’s easy not to notice it; she has such a tight grip on the mood and register that the piece’s tonal shifts – which move from the muscular and brutish to the flippant and coquettish – seem completely organic. She tightens and slackens the pace with such confidence, it’s as if you can hear the play’s heart beating. The performances she elicits are beautifully nuanced and rock solid. 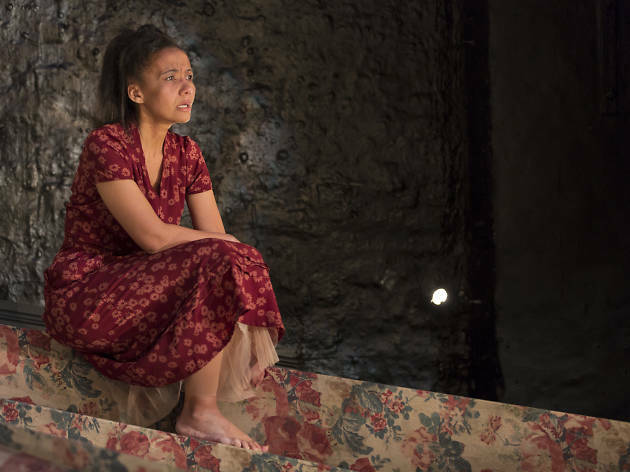 Arundell is masterful as the mother; steely-eyed one minute and dangerously drifting the next, she manages to combine the damage of the past with the determination of a future self not yet imagined. Ross and Harding are wonderful in support, newer to the game of survival but also quicker on their toes. Between them, they create a supple and convincing dynamic. Cerini has tapped into something vital in this take on an old, intractable disease. There is no violence without a community’s response to that violence; shock and disbelief just don’t cut it any more, if they ever did. The Bleeding Tree is a deeply ritualistic play – the body of this monster must be butchered and then displayed, before being eaten by crows and maggots, rats and dogs. His bones must be boiled and returned to the earth. And all of us must help. It’s savagely cathartic, and sadly will most likely remain so for years to come.